Steaming is one of the fastest and healthiest ways to cook — and it’s not just for vegetables. In this lesson, Martha demonstrates a variety of steaming techniques and tools that allow you to make complete meals in just minutes. She’ll show you how to cook chicken breasts in parchment paper for moist, flavorful meat, as well as how to clean and steam mussels. 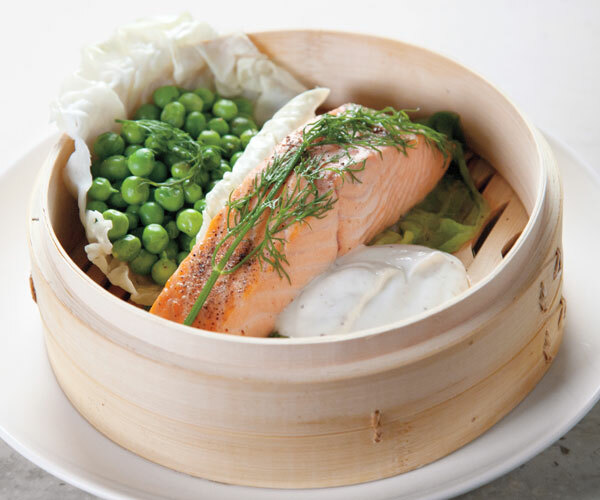 And if you’ve never used a bamboo steamer before, you’ll become a convert after watching Martha use one to prepare steamed salmon and peas simultaneously for a quick and easy dinner. Martha Stewart shows you some tips on steaming mussels, chicken, and salmon. What kind of potatoes make the best mashed potatoes? Martha Stewart tells you and explains why. Saffron is the key ingredient in this mussels recipe. It adds great color and flavor to this dish. Martha Stewart makes this steamed mussels recipe in the "Steaming" episode of "Martha Stewart's Cooking School." Holding mussels under cool running water, scrub with a stiff sponge or vegetable brush, then debeard: grip the tough fibers extending from the shell and pull to remove. Discard beards. Meanwhile, melt butter over medium-high heat in a shallow stockpot. Once it’s foamy, add shallots, garlic, and 1/2 teaspoon salt. Cook until shallots are transparent and garlic is soft, about 3 minutes, stirring every so often to keep garlic from scorching. Pour in wine and saffron, then add tomatoes and return to a simmer, stirring once or twice. Add mussels and cover tightly. Cook until all mussels open, about 6 minutes, stirring once about halfway through. Discard any unopened mussels. If using wild mussels, strain broth through a cheesecloth-lined sieve to remove any sand, if necessary. Taste the broth and season with salt and pepper. Sprinkle with parsley before ladling mussels and broth into bowls. This steamed mussels recipe appears in the "Steaming" episode of "Martha Stewart's Cooking School." Visit the episode guide to watch a preview and get a cooking tip.